I was born in the dark age when Communism was at large in Romania. By unfortunate circumstances, the lady who delivered me left the hospital without revealing her identity. I do not know what were her reasons to leave me. All I know is that as the years passed, I learned to forgive her. I tried to imagine that her reasons were serious ones, and also I decided to respect her choice of keeping me alive. Unfortunately, there is missing information in regards to my first three years of life. I found out that they moved me from one hospital to another until I was over two years old. I had no legal identity, meaning I had no rights. But even if I had had a name or identity during the black age when I was born, the abandoned children did not have rights at all and they were placed in children’s homes and subjected to all kinds of abuses. Maybe for the reason that I had no identity or because of somebody’s decision, I was diagnosed as ”IRRECOVERABLE” and sent to Cighid children’s home in Bihor County. It was more like a concentration camp or green mile, where according to my recent research, a strong child would live up to six months or a year, and after that, the child was buried in the nearby cemetery. I will won’t speak about the details or what it meant to survive there, but anyone interested can search on the internet (see video below). Even though I was sentenced to an early death, there was a God who had a different plan for me. Now the question is, why did He choose me, when others died without being mourned and known by anyone? Still, I thank God for the gift of life. Right after I turned three years old, in 1990, the horrors from Cighid were discovered. The place was shut down, and the children who survived the green mile were brought to hospitals, especially the Infant Neuro Psychiatry hospital in Oradea. This was how I got settled in the department of Dr. Monica Platon, a neuropsychiatrist. The most important thing that brought the change of my destiny was that Dr. Platon gave permission to volunteers to come work with the children she was responsible for. At a little over 3 years old, I weighed around 10-12 pounds and refused to swallow any food. I would only lay on my back and fix my eyes on the ceiling without any ability to move. That was when I was found by Corina, the lady through whom God changed my destiny. In those times, Corina was a young girl, 19 years old, who came to volunteer with the children in the hospital. Corina stood by me, talking to me and comforting me by stroking my head with her hand. So, the long and difficult journey to my recovery started from here. Slowly, with some mashed biscuits on my tongue, I started accepting food from Corina’s hand. She brought me secret, home-cooked food because the hospital food was lacking vitamins and was never enough. Little by little, I gained strength and was able to rise, sit up, then stand on my feet to the surprise and joy of Corina. She was daily caring and practicing with me for hours. Dr. Platon was also overjoyed at my progress. She finally yielded to Corina’s pleading, and decided to give me special permission to visit Corina’s home. In that time, Corina was living with her parents and her eight brothers and sisters, the youngest being two years older than me. After the two days I spent at Corina’s home where everything was new, clean, different, and nice, Corina had to take me back to the hospital. I started desperately to cry. The next weekend I again went home with Corina, with the signed permission slip. This time, Corina decided to risk herself and not to take me back to the hospital again. In those times, foster care was something new, and nobody had any idea how to do it. Finally, after one year of countless signed permission slips, with the willingness of Dr. Monica Platon and through a delegation from the child protection department, I was sucessfully placed in foster care in the Caba family. This family, Corina’s family, gave me a new identity, a birth certificate, and a brand new life. At the age of 5 years, after one year in the Caba family surrounded with love, safety, everybody’s attention, and a lot of good and healthy food, my progress was huge. Mom and Papa Caba, Corina’s parents, loving accepted me in their family and treated me as if I was their own child. Simona, Manuela, Lidia, Benjamin, Sami, Dani, Alin and Andrew, all surrounded me with a lot of affection, just as their youngest sister, and I learned to trust and feel protected and secure. When Corina took me to Dr. Platon for checkups, she was always amazed by my obvious progress. I have to re-emphasize that at three years and three months, when the hard work started with me, my stage was like a newborn baby. The only achievements I had were the trauma and the wounds that required healing. At almost five years, I was walking very well, I had no more need of diapers, and I was eating by myself. I was trying to speak, but I could not pronounce clear words. However, I understood everything I was told and when Corina used to read me bedtime stories, I already knew what the next page was about. I had a special attraction to music. I loved listening to it and I used to sing in my language. When night came, I wouldn’t fall asleep without Corina, because she had to put her hand on my cheek until I would fall into a deep sleep. There were often times during the night when I woke up so scared, screaming as I watched an unseen terror. I would only calm down when Corina woke me up, comforted me, and put her hand on my cheek again so I could fall into a deep sleep. Corina wanted to take me to kindergarten, but she was very worried about my inability to speak. Every night after I’d fall asleep, Corina used to pray for my healing with her hand laid on my head. One night, after she prayed for about an hour, she had a vision. She saw my brain trapped by a black hand with big sharp nails that was keeping it in the darkness. This picture persisted as Corina was praying, and she kept saying: “Oh, Lord, I will not stand up from my knees until you take aside this black hand!” After a few minutes, as she continued to pray, she saw a hand full of bright, shining light descend and remove every finger, one by one, of the hand that kept my brain captive. The next day when I woke up, I spoke clearly for the first time, not only a word, but a whole sentence: “Mom, I want to eat.” After that, my progress tripled. I remember even now what the prayers of Pastor Caba, Corina’s father, did for me. He was always there to pray for me and encourage me. When I started school, four years of hard work were awaiting me. After a long day at school, I had another 4 hours of homework and piano exercises with Mama Caba. Every other day, I had to do my physical exercises to recover my mobility. I also had swimming lessons. This whole journey was pretty difficult, but when I was tested again at the end of the 4th grade, my IQ was around 100. 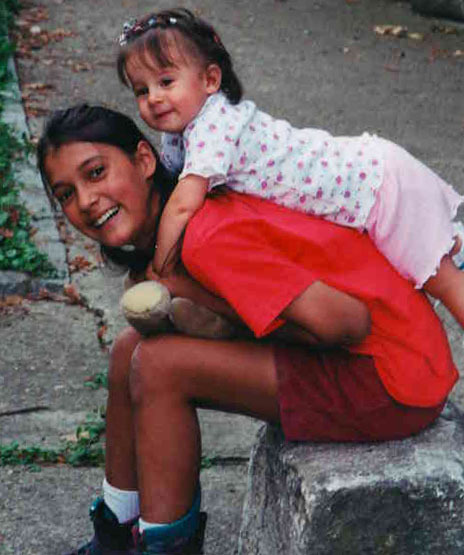 Ramona in 2001, with a Caba cousin. The time passed, and little by little I discovered the story of my life. Because I was dark-skinned, I had to face a lot of prejudice, whether in school or the community. When I turned 10 years old, my adoption was finally legalized, and my official name became RAMONA CABA, a name I proudly received. Corina Caba became my legal mother. To adopt a child in those times was something new in our Romanian society, but to have adopted a dark-skinned child was inconceivable for the many people. Unfortunately, there is still a lot of prejudice toward dark-skinned children in Romania, especially the Roma children. But I want to tell these children that we all are equal in God’s eyes, we are His creation, and not even the color, not even the intelligence or the outfit will make someone more special, valuable, or important. The wise king Solomon said in the book of Proverbs: “What is desirable in a man is his kindness”, and this kindness is not inherited by us, but learned from those who display it to us. Show the child goodness so he learns to be good. I am saying all these things because I had to face all the bullying and the challenges from other people, just because I was dark-skinned. Still, I have learned to forgive and answer kindly to these challenges because I have always been surrounded with love and kindness at home. I was accepted, loved, and protected, and this helped me pass over it all. When I started 5th grade, I had no need of help with my homework. In the 7th grade, I received an award for a national music competition for piano. I graduated High School with almost an A, and I did excellent at the graduation exams. I say none of these things to praise myself or anybody else. All the glory, honor and praise belongs to our God, the King of Kings who not only plucked me out of the darkness and spared me from death, but also healed my brain, my mind, heart and soul. What else can I say about me? After I graduated high school, I went to the university, continued my piano studies, and married Emil Dudas in 2009. In 2013, April 26th, the Lord gave me the greatest privilege to become a mother when He blessed us with our beloved and precious son, Simeon. He is a brilliant child, healthy and perfect from all points of view, just like every good and perfect gift that comes from above. I pray that God helps me be a good wife and mommy, and that my life glorifies Him so that I may spread His goodness and light with which He healed me and touched my life. When I look behind, I see no sad story because of the trauma or suffering which has marked me. What has really molded my life and my character was the way God saved me from it all. His victory over all of this and the miracles He performed has put its mark on me. These have made me what I am—and what I will be when He accomplishes all He started in me. I see the way God has saved me and has given me a new meaning of life, a brand new identity and a hope and light-filled future. I will end my testimony with a special verse from the Bible, Jeremiah 29:11. It says, “‘For I know the plans I have for you,’ declares the Lord, ‘plans to prosper you and not to harm you, plans to give you hope and a future.’” I pray this will encourage everyone who needs to be redeemed, healed, and restored. For I am a living witness that there is no man or child that is irrecoverable, and there is no one who cannot be restored by God. He works through His people who are ready to become His outstretched hands, so they can uplift those in need. Ramona Dudas is the daughter of our ministry director, Corina Caba. Her story inspired Corina to a life of ministry among abandoned children, and hundreds more have been saved. To support our ongoing work to place abandoned children in families, click here.